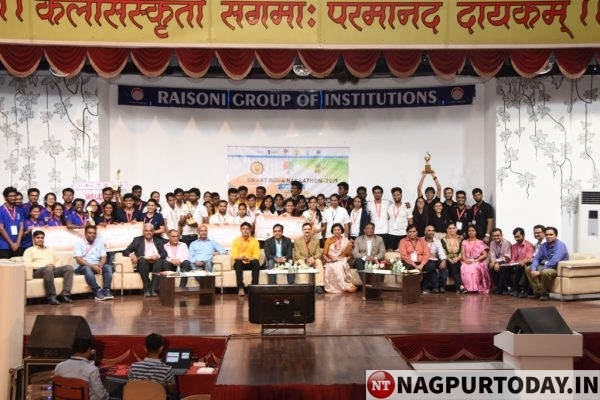 Nagpur: The Grand finale of Smart India Hackathon 2019 organised by MHRD and AICTE concluded with a winning note at GH Raisoni college of Engineering Nagpur. Chief Guests of Valedictory function were Chintak Sutaria, Associate Director & Global Delivery Head Salesforce at PwC India and Special Invitee Mr. P. M Parlewar Director, MSME-DI, Nagpur. The report was presented by Dr. Preeti Bajaj, Director GHRCE. Total 28 Teams from 14 States, 23 cities and 27 institutions consisting of 167 students participated and worked continuously on 7 problem statements by Goa shipyard and ministry of Micro, Small and Medium Enterprises (MSME). Three panels of three judges each have evaluated teams in three rounds. Each team has been evaluated by 9 judges Mr. Vikash Chandra Ambastha(GOA Shipyard Limited), Dr. Meenakshi Arya(GHRCE), Mr. Shripankh Patil(MSME-Mumbai),Mr. Prasanna Deshpande(TCS),Dr. Urmila Shrawankar(GHRCE),Mr. S.V. Rasal(MSME,-Mumbai),Mr. Rahul Kumar Mishra(MSME),Mr. Ajay Lohakare (Persistent Systems Limited), Mr. M.B. Gaikwad(GHRCE) on various criteria such as solution approach to problem, ambitiousness/ complexity/impact factor, technology and innovation attributes and user experience attributes. Based on above criteria 7 winners for 7 problem statements, were announced. Team “Tell us something that we don’t know” from Walchand College of Engineering-Sangli and Team “Gully Bois”from Thodomal Shahni College of Engineering-Mumbai. Team “Incognitoos” from MIT-World Peace University-Pune. The outcomes of the 36-hour nonstop efforts of Teams were Innovative solutions which will help the organization and ministry in the long run. Further it would boost entrepreneurial capability of technical students. All the participants Teams were very happy with the overall arrangement made by GH Raisoni college of Engineering – Nodal Centre. It was great learning experience for all young technocrats.